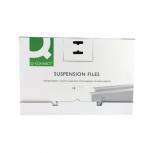 Q-Connect Suspension File Insert White (Pack of 50) KF21003 Pack of 1 Pack of 50 blank suspension file inserts. Great for relabeling and reusing your files. Presented on a handy A4 sheet. Perforated for easy separation. Blank for writing or printing. Designed to fit inside Q-Connect filing tabs. Colour: White. 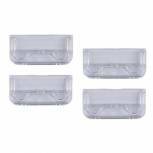 Q-Connect Suspension File Tabs Clear (Pack of 50) KF21002 Pack of 1 Clear plastic helps magnify the text on the insert for easy viewing. Angled for easy reading. Specially designed feet grip the suspension files neatly. Designed to work with the Q-Connect suspension filing range. Use with Q-Connect File Inserts. 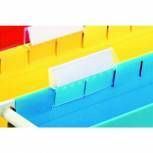 Q-Connect A4 Tabbed Suspension Files (Pack of 50) KF21004 Pack of 1 Q-Connect A4 Suspension Files. Manufactured from tough manilla to withstand constant everyday use. Supplied complete with snap on tabs and White inserts. File Colour - Green. 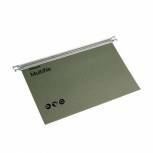 Rexel Multifile Suspension File V Base 15mm Foolscap Green (Pack of 50) 78008 Pack of 1 Multifile Suspension Files. Constructed from strong manilla with a standard capacity of 15mm or 150 sheets of A4 80gsm paper. Includes tabs and inserts. Size - Foolscap. Colour - Green. 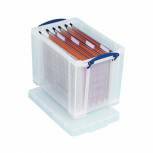 Rexel Crystalfile Printable Filing Inserts White (Pack of 50) 78050 Pack of 1 Twinlock Crystalfile Inserts. An efficient method of highlighting priority files or setting up a fast retrieval colour coded filing system (Blue, Green and Pink also available). Colour - White. (for clear tabs see TW78020). 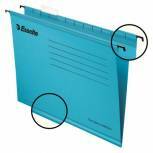 Esselte Classic Foolscap Blue Suspension File (Pack of 25) 90334 Pack of 1 Esselte classic economy foolscap suspension files. Tabs and inserts supplied. Blue. 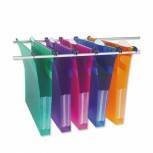 Rexel Crystalfile Plastic Suspension File Tabs Clear (Pack of 50) 78020 Pack of 1 Crystalfile Tabs. Snap on tabs for use with all Crystalfiles except linked and lateral. Colour - Clear. Esselte Classic Foolscap Red Suspension File (Pack of 25) 90336 Pack of 1 Esselte classic economy foolscap suspension files. Tabs and inserts supplied. Red. 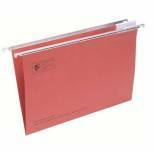 Rexel Multifile Extra Linkable Suspension File 30mm Foolscap Assorted (Pack of 10) 2102574 Pack of 1 Multifile Extra Suspension Files. 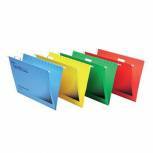 Tough polypropylene suspension file with repositionable tabs. Linkable bars and 30mm gusset. Assorted colours. 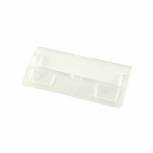 Esselte Classic 50mm Tabs and Inserts (Pack of 25) 94514-R1 Pack of 1 Esselte Classic Suspension Tab Plastic Pk 25 94514-R1. For use with Esselte Classic suspension files. 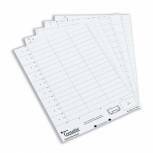 Rexel Crystalfile Classic Linked Top Tab Inserts White (Pack of 50) 78290 Pack of 1 Twinlock linked White inserts to be used with linked crystal file. Shown complete with linked Crystalfile. 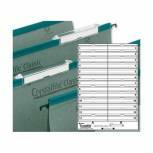 Rexel Crystalfile Classic 15mm Suspension File Foolscap Green (Pack of 50) 78046 Pack of 1 Rexel Foolscap Crystalfiles. Individual suspension file manufactured from extra strong manilla with contrasting interior, preventing misfiling while in situ. Pre-punched to take Acco fasteners and supplied complete with tabs and inserts. Green. 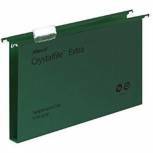 Rexel Crystalfile Extra 30mm Suspension File Foolscap Green (Pack of 25) 70631 Pack of 1 Tough plastic suspension file made from strong polypropylene material to beat daily wear and tear. Large 30mm capacity for storing bulky files. Extra strong steel runners to support heavy loads. Complete with tabs and inserts. Foolscap Green. 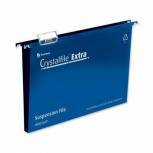 Rexel Crystalfile Extra 30mm Suspension File Foolscap Blue (Pack of 25) 70633 Pack of 1 Tough plastic suspension file made from strong polypropylene material to beat daily wear and tear. Large 30mm capacity for storing bulky files. Extra strong steel runners to support heavy loads. Complete with tabs and inserts. Foolscap Blue. 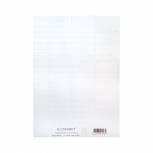 Rexel Crystalfile Flexi Tab Inserts White (Pack of 50) 3000058 Pack of 1 White tab inserts for easy labelling of your files. Fully customisable for your convenience. Helps to separate and organise files. Fit neatly into Rexel Flexi Tabs. For use with Crystalfile Suspension files. 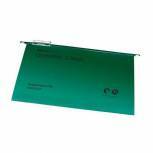 Esselte Classic Foolscap Suspension File Green (Pack of 25) 90337 Pack of 1 Esselte classic economy foolscap suspension files. Tabs and inserts supplied. Green.Strengthened with a reinforcing tape applied to the bottome of the file and to the rods. 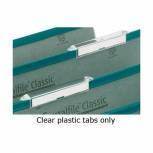 Rexel Crystalfile Classic Tabs Clear (Pack of 50) 78289 Pack of 1 Twinlock linked top tabs to be used with linked crystal file. Shown complete with linked Crystalfile.